The folks over at Tales and Tails have suffered a terrible blow last Monday. They lost their beloved Grand Dame, Lilac. Though I am late in learning the news and offering my condolences it is as heart-felt and sincere as any I have ever offered. The hardest part of loving a Greyhound is having to say that final good-bye. Many hugs for having given a senior a home and allowing to be taught to love the way that only seniors can teach you. 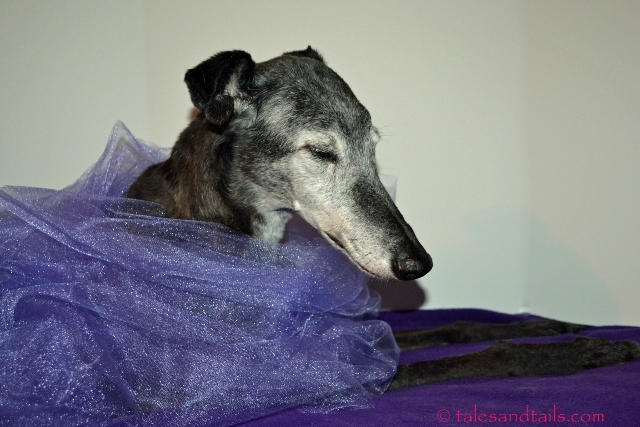 They are wonderful and it is a rewarding, fulfilling experience to adopt a senior Greyhound. God speed Lilac, God Bless her family that misses her so much. We miss her too. “Since she’s lived with us, the poem Warning: When I Am An Old Woman I Shall Wear Purple by Jenny Joseph has always reminded me of Lilac. Lilac…I love the color purple. When I look at the stars at night I will know you are there running with the rest of my loves who have gone before you. They will greet you and invite you to run through the open meadows of soft grass and flowers, the sun always on your back to warm you. The rainbow bridge is a beautiful place where I someday hope to sit and watch all of my beautiful greyhound loves run and play. I hope to see you there with them when the time comes.